As you can see, I decided to renovate this space again. I got bored with Blogger’s very standard templates, and started testing new, very pretty templates out. After playing around with a few two column templates, I decided that three columns was the way to go for me. More organization, more room to play… I think I like it. I think it’ll stay the way it is now, though I’ve downloaded half a dozen other templates in the event that I change my mind. In other news, I’ve gone and joined another quilt-a-long. This one is hosted by Rachel at p.s. i quilt. 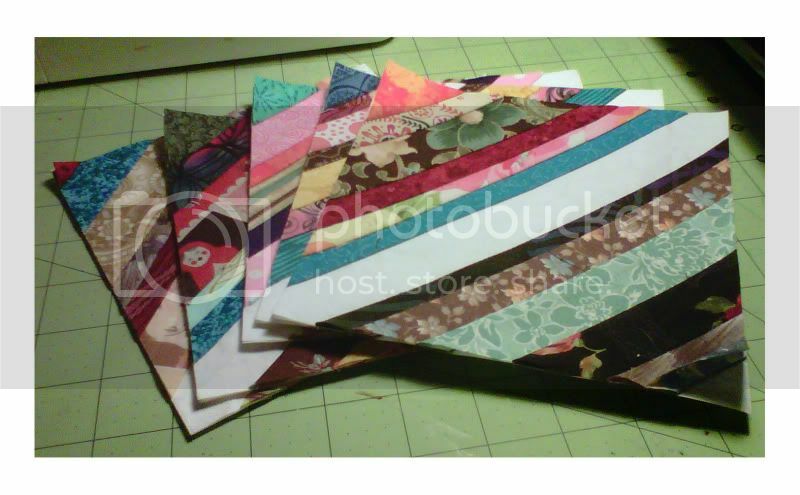 The sampler quilt we’ll be emulating is gorgeous! I look forward to this one – a good chance for me to strengthen my piecing skills. Twenty-three down. I’ve no idea where this thing will top, though, so I can’t judge how many more I’ve to make yet. The blocks are 6.5″ 6.5″, for a finished size of 6″ X 6″, and are comprised of strips of varying widths froms just about every project I’ve completed and/or attempted. I’m enjoying it. It’s pain-free, guilt-free piecing. There’s no plan to adhere to, all of the pieces are scraps, even the white centers (left over from Amanda Jean’s quilt-a-long, blogged here)… It’s so simple to do, it’s actually quite relaxing for me. I just have to settle down and get several paper squares cut down. I’m using standard lined, three hole punched paper. It’s so thin, it tears right off, though I’ll be saving my old phone books in case I have the yen to do something similar in the future. Meh.. No worries. I’ll let the quilt decide when we get there. Hmmm.. That’s what I’ll called this little string quilt – No Worries. It’s appropriate.